Customers evolve. So does the marketing landscape. Today’s customers are in total control of their purchase journey, forcing brands to find effective ways to deliver compelling and personalized experiences at every touchpoint. How can brands move at the speed of their customers and fully meet their expectations for personalized communication? The answer is through marketing automation. While there are many tactics that marketing experts can use to better engage their customers throughout the customer journey, marketing automation combines technology, data, and trends to take your communication efforts to the next level. When done right, marketing automation can help your business succeed. Read on to learn what marketing automation is along with examples that you can start using immediately. We will also explain why marketing automation tools are essential to your brand and present to you the steps to determine whether your company is ready to invest in marketing automation or not. Marketing automation is a powerful technology solution that automates marketing for you. Usually, it is a tool or software that helps you manage, optimize and automate repetitive marketing tasks. Related: Marketing automation and CRM: What should you choose? Marketing automation enables businesses to better connect with their customer with the right messages at the right moment, delivering personalized and consistent experiences across touchpoints. So, with marketing automation, businesses can send automated messages across email, web, social, and text. These messages are automatically sent to customers based on rules (workflows) that the marketer has set. Below you can find effective ways to use marketing automation and boost not only customer engagement but conversions too. Interacting with your target audience in real – time throughout their customer journey is now possible and -even better- easy. The answer lies within an already well-known marketing tool: email. Your newsletter campaigns become an even more powerful tool for you as the automation technology enables you to reach your customers faster. When a customer registers to your blog or newsletter, you can automatically send them a welcome email or a thank you message. Another effective example is when a user leaves your e-shop without making any purchase, he/she can get an email with a reminder of the basket along with a special offer or a discount. In this way, you give incentives to your customers and increase your conversion rate. This can also work for your brick and mortar store. When a transaction is completed, send a thank you message or ask the customer to rate his/her experience in the store. Gift tip: Create urgency through your email messages to increase customer traffic! With marketing automation, you not only automate email marketing campaigns as you can schedule your emails according to a set of rules, but you are able to automate email A/B testing too. Automatically recommend the right products for each one of your customers. This can be really useful in both digital and physical environments. Leverage mobile moments and connect with your customers during their store visit in the most effective way. Mobile is a personal channel and in order to win your customers’ attention, you need to be relevant. Use customer insights to send dynamic content that personalizes according to your customers’ past shopping behavior. Especially if combined with other technologies and tactics such as beacons and proximity marketing, marketing automation can truly transform your customer’s experience. Tip: Always remember that relevance is the key to meeting your customers’ expectations and boost engagement. Send useful and relevant recommendations according to your customers’ needs and preferences to create more up-sell and cross-sell opportunities. Powered by artificial intelligence, QIVOS CLOUD enables you to design campaigns with product recommendations that improve customer experience and retention. Learn more now. How? Invest in the right technology platform and tools. Marketing automation tools allow you to effortlessly collect valuable insights at scale and put it immediately to work. So, you’ve created your marketing campaigns around customer insights. Then, the system should be able to continue learning about each customer and collecting data from the customer’s interactions long after you’ve set up the campaign. Extra tip: Gain more insights through automated customer satisfaction surveys. Follow up a transaction with a survey, asking your customers to rate their latest experience. There are many marketing automation tools in the market. Most of them connect with your CRM and existing tools to provide you with the best results. One can find a marketing automation software that only automates one part of your marketing tasks, such as the email campaigns or the social media scheduling, or is part of a bigger system that helps you manage the marketing efforts from a single place. Choose a platform that uses next-generation technology, such as machine learning, in order to be able to not only properly collect customer insights but also automatically fuel your multi-channel campaigns with them in an ongoing basis, while helping you seamlessly track and measure your efforts. With a variety of marketing automation tools available today, brands are able to precisely target their audience and shorten the distance between what customers want and what they actually get. From placing your customer’s name into the subject line to next level personalization with post-purchase offers and real-time product recommendation based on purchase history while the customer is in-store, using data to go beyond the basics and truly connect with shoppers is the only way to win. Use customer data to fuel real-time contextual marketing campaigns and connect data-driven customer insights to improve operations and personalize the customer journey. Another excellent use of marketing automation software is for moving prospects closer to using your product or service. Though automated marketing campaigns that use if/then logic, you can deliver personalized messages tailored to the interests of each prospect. These messages could contain educational and informative content that will help your prospects learn more about your products and services and how your solutions meet their specific needs. In this way, you build trust between your company and your audience while also maintaining a meaningful relationship. Tip: By creating lead nurturing campaigns, you refine how you target your customers during the customer journey as you build a whole process around their lifecycle. As humans, we like to be appreciated and feel unique. Marketing automation enables you to address the emotional complexities of loyalty too. Show your customers your appreciation for being loyal to your brand with a customized thank you email message, along with a discount code for their next purchase. Setup a customer loyalty program to reward your loyal customers and drive customer loyalty and retention. Don’t forget to reach your customers on special days and occasions such as birthdays, to deliver personalized messages and exclusive rewards. Marketing automation lets you orchestrate campaigns that keep customers alerted and engaged with your services or products, making them feel special at every touchpoint. In this way, you can build a long-term, plus meaningful, relationship with them. If you are thinking of investing in a customer loyalty program, read our eBook “How to build a profitable loyalty program in 7 steps” first. Download your free copy here. Here are some common marketing automation mistakes, and what to do in order to avoid these 4 pitfalls. Still wondering how can marketing automation be beneficial for your business? We’ve gathered all the reasons why marketing automation is an investment worth making today. You can easily determine what content, which marketing channel, marketing message, etc. works best to acquire new customers and to retain the existing ones. Through marketing automation, you can acquire rich insights about the customer that will help you design data-driven communication strategies. Remove the guesswork. Always know what your customers do in each step of the shopping journey. Automate key processes, schedule interactions and free up your team’s valuable time. Lead nurturing campaigns with relevant content help you create authentic engagements and improve the relationship with your audience. Make smarter decisions. Gather customer feedback and focus on what really matters to your business. Marketing and Sales department can have a clearer view of what is or isn’t a marketing or a sales-qualified-lead as key processes are now automated and redefined. Better processes lead to better customer experience, thus improved ROI of your marketing efforts. New! Calculate your Return on Investment with our advanced ROI calculator tool. Try it now. Marketing automation helps you move at the speed of today’s customers and meet their expectations for superior experiences faster. What does marketing automation mean for the customer journey? Here’s a list with the benefits of marketing automation for your customers. Now you know how marketing automation works and how it can benefit your business. But before investing in this technology, make sure you ask yourself these four key questions below. These questions are relevant to all companies, regardless of industry. Does your business generate new, qualified leads? How does marketing automation tools help you improve the quality of those leads? How does marketing automation help your marketing and sales team manage these leads? Does the marketing automation platform successfully integrate with your CRM solution? 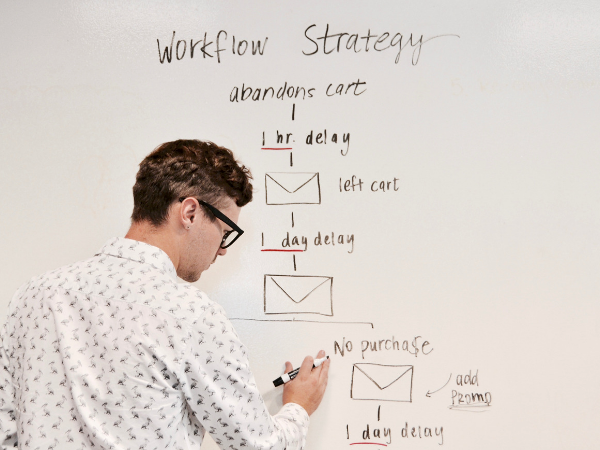 Bottom line: Marketing automation will, without doubt, elevate essential processes of your organization, including these of the marketing and sales department. But it goes way beyond automating your marketing department’s repetitive tasks. The key here is to understand how this solution can add value to the organizational processes and help you scale your efforts. By answering the questions above, you will be able to define which goals will be achieved through this technology and get prepared for investing in the right solution based on your specific needs. By 2020, 85% of customer relationships with businesses will be managed without human interaction, says Gartner on their Gartner Customer 360 Summit. Are you considering investing in marketing automation? What marketing automation tools are you using? Tell us in the comments below!